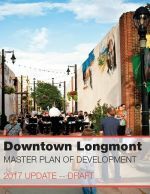 Please let us know your thoughts on our draft Master Plan of Development for Downtown Longmont. You can either download the .pdf, make comments on the document and e-mail them to us OR just send us your thoughts via e-mail. Click here to see the Draft Master Plan. Or, you can put your comments directly into a document. Click here to access the Plan via the Civicomment tool. Be sure to create a log in and password to be able to comment directly on the document! On Monday, September 19, PUMA facilitated five work groups in the areas of Land Use, Economic Vitality, Placemaking and Urban Design, Connectivity and Access and Creative District. In the work groups, they reviewed current, relevant plans; discussed market assessment findings as well as received feedback from the groups on each of its topic areas. Future meetings are planned for November and December. The Steering Committee reviewed immediate findings, as well as discussed a baseline survey that will be sent out soon to the public. A review of all the PowerPoint presentations can be found here.